Whenever I head out of town, I try to make sure to leave a few goodies in the fridge for Eugene to eat while I'm away. I make a few mains and sides, then let him put them together however he'd like. This weekend, I'm heading up to Vermont for a few days to work as a guest chef at Good Commons, so I want to make sure that Eugene is as well-fed as the retreat participants. First up on this list are these Baked Thai Coconut Curry Chicken Breasts, which are beautifully fragrant, with just a touch of heat. This is an easy dinner recipe that's perfect for busy weeknights. I especially love this recipe because it requires practically zero prep on my part. All the ingredients are pureed in the blender and then poured over the chicken--then the oven does the work. So easy, and the final dish is rich and flavorful. Serve this one over fluffy jasmine rice or quinoa to soak up that lovely sauce. Leftovers would also be wonderful in a sandwich or wrap. Preheat oven 350 degrees. Arrange chicken breasts in a single layer in a roasting pan. Sprinkle generously with kosher salt and black pepper. In a blender, combine coconut milk, curry paste, ginger, garlic cloves, and cilantro. Puree until smooth, then pour mixture over chicken. 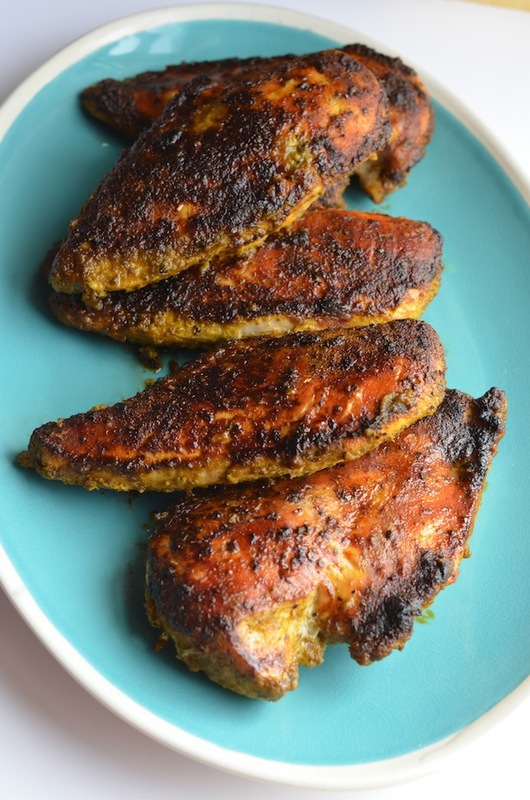 Bake chicken for 30 minutes, then turn on broiler and broil for an additional 5-7 minutes or until crispy and slightly charred on top (keep on eye on the chicken as broilers vary). Remove from oven and let rest 5 minutes before serving. Serve over rice or vegetables, with leftover pan sauce drizzled on top.